Sit back and relax in The Canongate Residence. Overlooking the Royal Mile in the Old Town, this one-bedroom apartment enjoys an enviable location, neighbouring Edinburgh Castle and Holyrood Palace. The lovely and light living/kitchen area features comfy seating and sofa bed, flatscreen TV and unlimited Wi-Fi. The modern kitchenette comes fully equipped with everything you need for a few days in Edinburgh, including a microwave, fridge and a few bits and pieces to get you started when you arrive. The cosy master bedroom offers a double bed and guest storage. A family bathroom with shower over bath completes this delightful home from home. The Canongate Residence’s location is simply the best! Sitting on the Royal Mile in Edinburgh’s world-famous Old Town, the local area is brimming with history and things to do. Whether you’d like to browse the varied boutiques on Cockburn Street or have a good old fashioned pub lunch while you gaze up at the Castle, this property has it all. 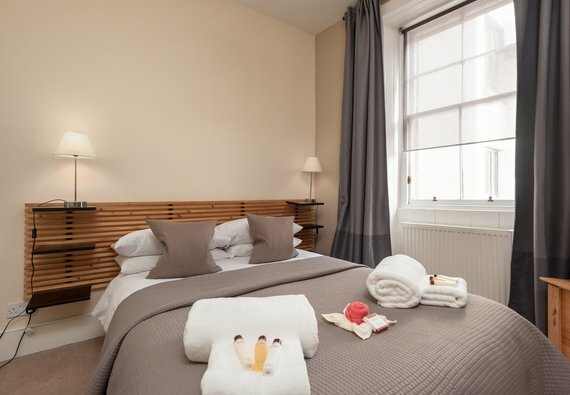 Princes Street is a mere 10 minute stroll away, and the Grassmarket is just around the corner. We guarantee that you’ll find intrigue galore on your doorstep - but if you’d like to venture further afield, Waverley train station is within easy walking distance and the area is well serviced by the extremely efficient Lothian Buses. Interior layout A central hallway leads to an open plan living/dining area and kitchen, a master double bedroom, and family bathroom. No reviews yet for The Canongate Royal Mile Residence.